I like to think of myself as fearless in the kitchen. It’s not true though. Not, at least, when it comes to Thai curries. Oh, I’d made them before. I’d gone to the Thai aisle in the Asian markets and picked out a pre-made rainbow (red, yellow, green, etc.) curry paste. 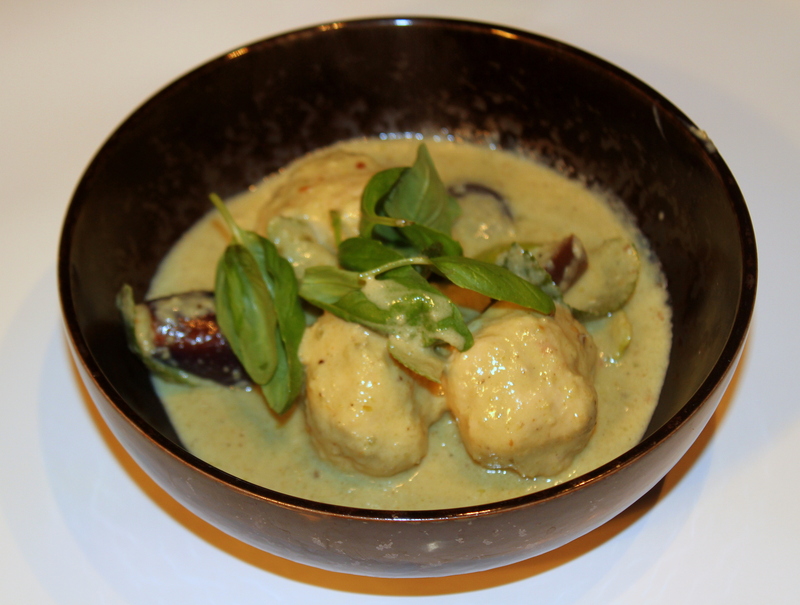 The results were acceptable—recognizable as Thai curry—but definitely not great. The curry was spicy, yes, but salty and neither bright nor round. There had to be a better way. The shortcut, it occurred to me, might have been the problem. Sure, that long list of ingredients needed to make a curry paste seemed intimidating, but it was more of a shopping issue than one of cooking. Other than toasting the spices it really was just a matter of putting all of the ingredients in a food processor. How difficult could that be? The answer: not very. There was, however, another problem: fish sauce. Because fish sauce is primarily fermented anchovies there ought to be certified kosher fish sauce products. Unfortunately, I have found no such product available in the United States (I’ve caught wind of a UK product looking for an American distributor). My choices seemed to be: (1) use kosher salt or soy sauce as a clearly inferior substitute or (2) develop a concoction that would mimic the funky flavor profile of fish sauce. I went with the later approach; breaking anchovies down in a slow steep, then adding garlic, dry mustard soy sauceand Worcestershire sauce before straining the final product. While it may not work as well in the context of a recipe in which fish sauce is a more prominent ingredient, it works perfectly well in this curry. For the fish balls I visited Catalina Offshore Products for some monchong, a delicious deep sea pomfrot from Hawaii. If monchong isn’t available, mahi mahi, ono or opa make excellent alternatives. Get whatever is best and freshest. 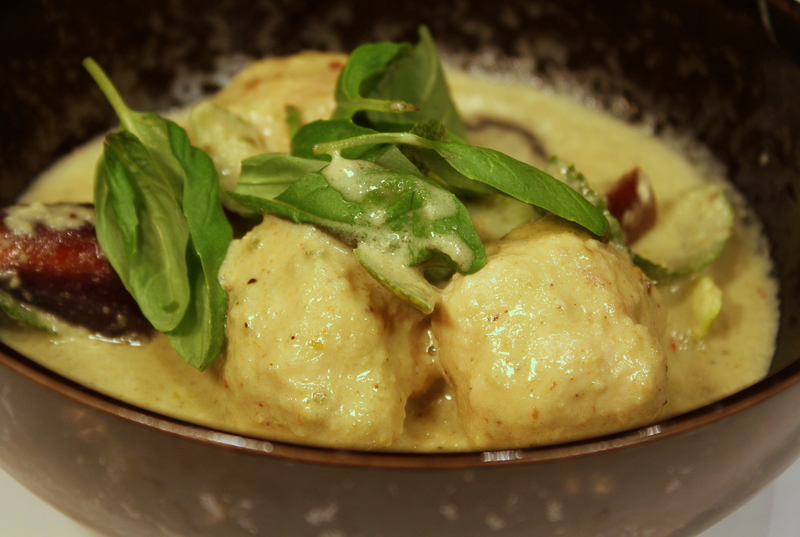 Making the fish balls was easier than the curry paste: everything into the food processor. If you can make a hamburger you can make a fish ball. The resulting dish is a much brighter, less saline and far more subtle and well-rounded Thai curry than commercial pastes produce. And, remarkably, it was not much more difficult than using those paste. It was enough to make a guy fearless in the kitchen. Make the Green Curry Paste. Heat the coriander, mustard, cumin and anise seeds in a sauté pan over high heat until they just begin to pop. Remove the pan from the heat immediately and transfer the seeds to a spice grander, adding in the peppercorns. Pulse until finely ground. Transfer the ground spices along with the rest of the curry paste ingredients (except the coconut milk) to the bowl of a food processor and pulse until roughly chopped. Add in the coconut milk and process until smooth. Make the Fish Balls. Combine the fish and kosher salt in a food processor fitted with the “S” blade and pulse to combine. With the motor running, slowly add 2 tablespoons of water and process into a smooth paste. Add cornstarch, brown sugar, and white pepper; pulse until combined. Transfer the paste to a bowl and refrigerate for 30 minutes. Cook the Fish Balls. Bring a large pot of salted water to a boil over high heat. Using wet hands, roll the fish mixture into 16 balls, each about 1 inch thick. Cook until tender for a total of about 6–7 minutes. Beginning after the first minute, occasionally nudge the balls with a slotted spoon. When the balls are cooked through transfer them to a plate (using the same slotted spoon) and allow them to cool completely. Make the Curry. Heat coconut cream in a large wok or sauce pan over medium heat. Continue to cook the coconut cream, stirring occasionally, until the oil separates, about 8–10 minutes. Add ½ cup of the curry paste (reserving the rest) to the coconut cream and cook, stirring, until fragrant and slightly browned, about 4 minutes. Add the coconut milk and 1 cup water and bring to a boil. Add the fish balls and eggplant, reducing the heat to medium-low. Cook the curry, stirring occasionally, until the eggplant is tender, about 20 minutes. Stir in fish sauce, brown sugar, lime leaves, and chilis. Remove from heat and stir in basil. Plate the Dish. Ladle the curry onto the plate with cooked jasmine rice on the side. Steep the Anchovies. Warm the oils gently in a small saucepan over low heat. Add the anchovies and let them simmer until they break down naturally, about 15 minutes. It is acceptable – but not desirable – to break up the anchovies manually, with the tines of a fork. When they are nearly fully broken down remove the anchovies from the heat and let the oil cool fully. Combine the Remaining Ingredients. When the anchovies and oil are fully cooled, whisk in the powdered mustard. When the mustard and the anchovy oil are fully combined, add the soy sauce and Worcestershire sauces and whisk to combine. Blend the Sauce. Pour the sauce into the bowl of a high speed blender and blend to fully combine. Start the blender on the lowest setting and gradually turn up to high. Depending on how you plan to use the sauce either strain the sauce or not.